Alternative Name: この恋を忘れない。; I Won't Forget This Love; Kono Koi o Wasurenai. A collection of one-shots by various authors. Ready, Go! by Yoshii Yuu I hate poor guys! And yet, when I went on a date, I fell in love with a guy who's a freelance worker... and he came to our date on a bicycle!? Peach or Lemon by Kuramochi Mari After a small coincidence, I fell in love with him, but it seems that he already has a girlfriend!? And here I was, thinking that this love was fated to be... The Flower that Blooms in You by Mitsuya Omi Tsukina is secretly in love with her twin sister's boyfriend. After he lost his eyesight in an accident, she pretends to be her sister to take care of him, and then... Field Trip on Monday by Torikai Akane Shino got confessed to by two girls on the same day. For now, he doesn't mind dating the first one... Snow, Piling Up Feelings by Kimura Ayako Since I love him, I keep acting awkwardly around him and fall out of sorts with him... This is a story about a sad and heart-warming first love. 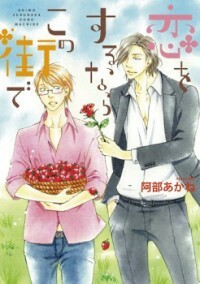 Senpai and His Girlfriend ~Call My Name~ by Nanba Atsuko My cool girlfriend won't call me by my first name... This is a very serious matter for a couple!